A Stampin’ Up! Workshop can be a really fun time to craft with your friends – it makes a GREAT Girls’ Night! And it can be a rewarding experience for you as the Hostess! Here are the details: Book a free class/workshop for you and your friends and you can earn the freebies below. These goodies are the free stamps and merchandise you receive from ME and from Stampin’ Up! for being a Hostess! Your workshop guests can now submit ONLINE ORDERS and have those orders link to your workshop, thereby increasing your workshop total and the rewards you receive! 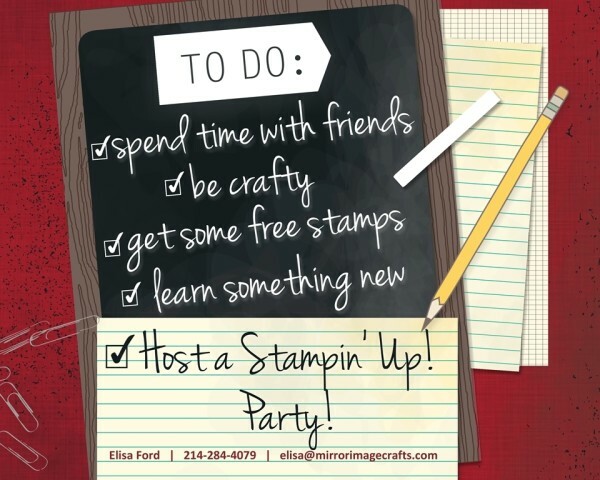 And all of the merchandise amounts can benefit YOUR Stampin’ Up! workshop! The Hostess Code will work for YOU, whether you have a traditional in-home workshop or a Catalog workshop. You don’t even need to live near ME to be my Hostess! I’d love to answer any specific questions you might have about the Hostess Code and how it can benefit YOU! I know planning a class/workshop for your friends can be a daunting process, but I WILL make it easy & fun for you. Contact me to schedule your date, or to ask any questions! This page refers to in-home workshops (mine home or yours! ), so it is intended for people local to where I live. If you aren’t local (Richardson, Garland, Plano, Wylie, Sachse, Murphy in Texas) then you can still receive regular hostess benefits by having a Catalog Workshop. Contact me for details anytime!